If you’re in the market for a new SUV, don’t miss out on the new 2018 Jeep Compass. It’s comfortable, fun to drive, and loaded with helpful safety features. For drivers looking to truly stand out from the crowd, your local dealer offers the 2018 Jeep Compass Altitude. Special styling cues enable this limited-edition model to make a powerful statement. 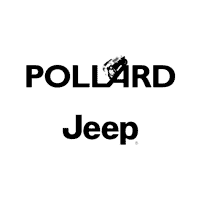 To see this exciting ride in person, stop by your local Jeep dealer serving Denver Longmont Thornton. Not only can you look forward to receiving great customer service, but you can also take advantage of the Denver area specials. The 2018 Jeep Compass is among the most attractive crossover SUVs in the Denver area. It looks like a smaller version of the iconic Grand Cherokee. While even the base model demands attention on the road, the Altitude edition will cause even more heads to turn. As soon as you drive home, expect all of your friends to be begging to take it for a spin. To set this limitedl-edition model apart from the rest of the lineup, Jeep gave it some exclusive exterior treatments. 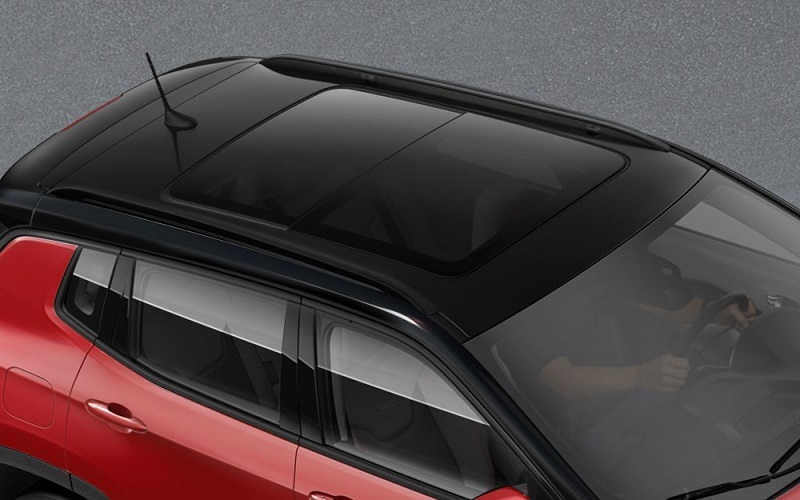 You’ll immediately notice the crossover’s contrasting black roof. Some of the jaw-dropping paint colors include Laser Blue Pearl-Coat, Redline Pearl Coat, White Clear-Coat, and Olive Green Pearl-Coat. While this model features a familiar seven-slot grille, it has been blacked-out to create a more striking appearance. 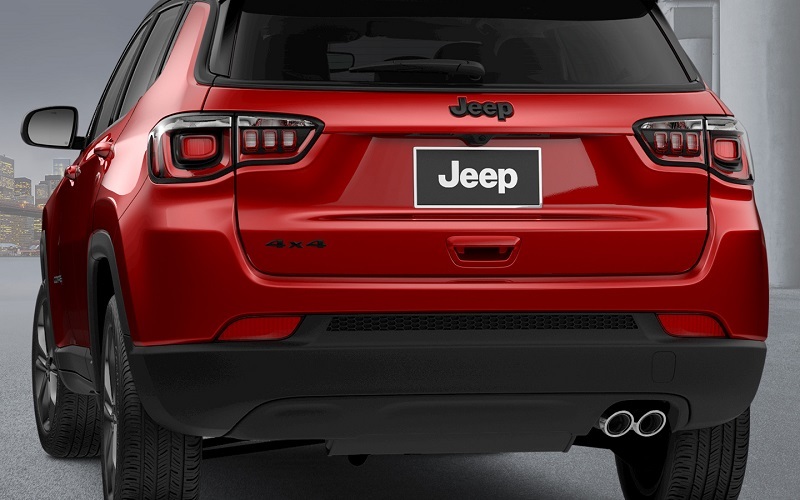 On the rear, twin exhaust tips and a black fascia insert further enhance the SUV’s sporty profile. Of course, you can’t forget about the 18-inch black wheels. They give the crossover an especially powerful stance. If this ride has caught your attention, don’t hesitate to come check it out. Remember, the Denver area specials will help you to save big! 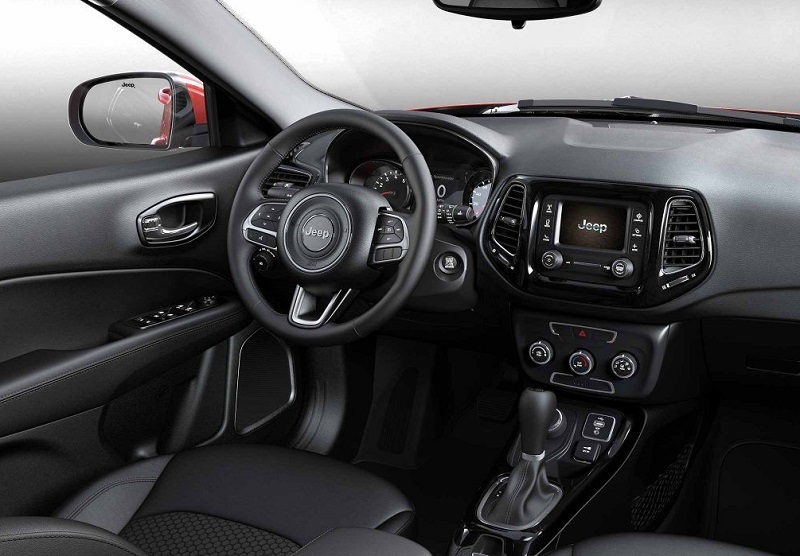 Designed to accommodate up to five passengers, the new 2018 Jeep Compass proves to be an ideal family vehicle. Everyone will have enough space to stretch their legs. Even your pets will be able to travel in comfort. Black cloth and vinyl seating gives the cabin an especially sleek look. While behind the wheel, easy-to-use controls help you to remain focused on the road ahead. A versatile cargo area makes this crossover even more rewarding to drive. From hiking gear to groceries, you can cram a lot of extra stuff in the back. As expected, the new 2018 Jeep Compass Altitude comes loaded with a long list of exciting technologies. Jeep’s Uconnect 4 interface with Apple CarPlay and Android Auto is bound to become one of your favorite features. You’ll be able to easily access your favorite smartphones apps. Some of the other standard equipment includes a 7.0-inch display, satellite radio, and Bluetooth connectivity. If you desire more luxury, take advantage of the available options. Denver area music fans will love the booming Beats sound system. An 8.4-inch touch screen with navigation makes long road trips more enjoyable. Your local dealer serving Denver Longmont Thornton invites you to come take a tour of the new Altitude edition! Expect the 2018 Jeep Compass Altitude to drive like a dream. A modern suspension ensures a smooth ride on the pavement. Whether you’re driving around the local Denver area or traveling out of town, look forward to experiencing a great deal of comfort. It’s also among the best-handling crossovers in the segment. It carves corners more like a sedan opposed to a traditional SUV. A precise steering system gives drivers an even greater sense of control. Meanwhile, standard front-wheel drive rewards you with great traction throughout the year. When parked on an incline, Hill Start Assist gives you an extra peace of mind. A 2,000-pound towing capacity adds to this crossover’s versatility. Trailer Sway Dampening helps keep your load secure at all times. Don’t miss out on your opportunity to come take a test drive! When driving the new Altitude edition, you’ll grow to appreciate its punchy performance. The standard power source is a 1.4-liter, turbocharged MultiAir four-cylinder. It’s tuned to develop a healthy 180 horsepower and 175 pound-feet of torque. Ample passing power enables you to easily merge onto busy highways. You’ll also have fun accelerating around town. A quick-shifting automatic transmission adds to this crossover’s responsiveness. Fortunately, the SUV’s strong performance doesn’t force you to spend extra at the pump. An efficient design makes it an excellent option for everyday commuting. There’s no overlooking the importance of passenger safety. You can definitely trust the new Compass to protect your loved ones. Solid construction enables this crossover to absorb powerful impacts. Several important safety features come standard. A ParkView backup camera takes the stress out of maneuvering in tight spots. During panic situations on the road, four-wheel disc brakes provide the maximum stopping power. To help drivers avoid riding on under-inflated tires, a tire pressure monitor has been added as a standard feature. Available as an option, the ParkSense Rear Park Assist system makes city parking even easier. To learn more, contact your local dealer serving Denver Longmont Thornton. Now is the perfect time to come test drive the new Compass. Denver area specials will enable you to keep a lot of extra cash in your pocket. This limited-edition model is destined to be a hot commodity!